We find Ragnar (Travis Fimmel) sick – peeing blood sick – so the next raid commences with Lagertha (Katheryn Winnick) sneeking into Paris via the river in the dead of night. She manages to slit a throat before anyone is alerted to their presence. A battle ensures, people are killed on both sides, but thanks to Lagertha using the hot burning oil trick against the Parisians, the Northmen waiting outside the gates are now free to enter. Meanwhile, as Rollo (Clive Standen) is scaling torturous balls of spiky hell, Count Odo (Owen Roe) is trying to convince King Spineless Charles (Lothaire Bluteau) he needs to be seen and show the troops some moral support. Needless to say this doesn’t happen. But what does happen is a very interesting conversation between the captured Sinric and Count Odo. It seems Rollo made quite the impression on the Parisians and they want to know who he is. Sinric describes Rollo as fighting like a crazy bear. This is interesting because the Seer (John Kavanagh) prophesied that a bear would marry a princess and suddenly the goo-goo eyes going on between the annoying Princess Gisela (Morgane Polanski) and Rollo make a whole lot more sense. While all this is going on, Ragnar is having visions of Athelstan (George Blagden) and I am beginning to really consider the fact he might be beyond repair this time. It seems this whole scene revolves around Athelstan being baptised and Ragnar not. Seems the Christians are taunting the vikings and Aslaug (Alyssa Sutherland) has to deal with it. A trial by fire, it turns out. What the Christian hopes will happen is that, by the grace of God, he will carry the burning rock across to Aslaug and prove his god’s existence. What actually happens is he squeals like a pig and Asluag is done with him. King Ecbert (Linus Roache) is continuing in his plan to go from my most liked Englishman (other than Athelstan) to my most hated. This week he promises to keepJudith (Jennie Jacques) and her son Alfred safe – so long as she presents her harlot card to him. He also pulls the ‘wounded dad’ face when his son, Aethelwulf (Moe Dunford), asks him if he was perhaps hoping Kwenthrith of Mercia (Amy Bailey)would kill him. It seems we have a plague on top of the viking invasion. It does nothing more than force hands, both those of Paris and the Northmen. 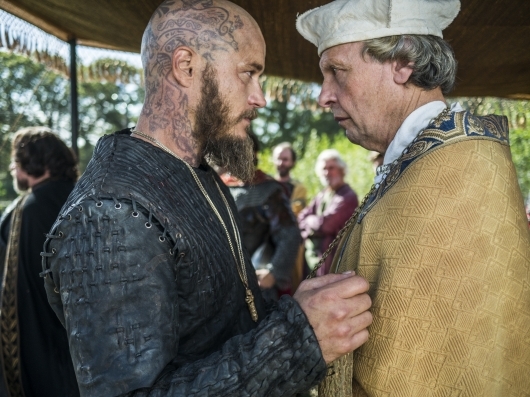 Ragnar calls dibs considering he’s the king and goes to make a deal with the the Parisians – but first he wants to be baptised. And boy doesn’t that piss of all the vikings?! 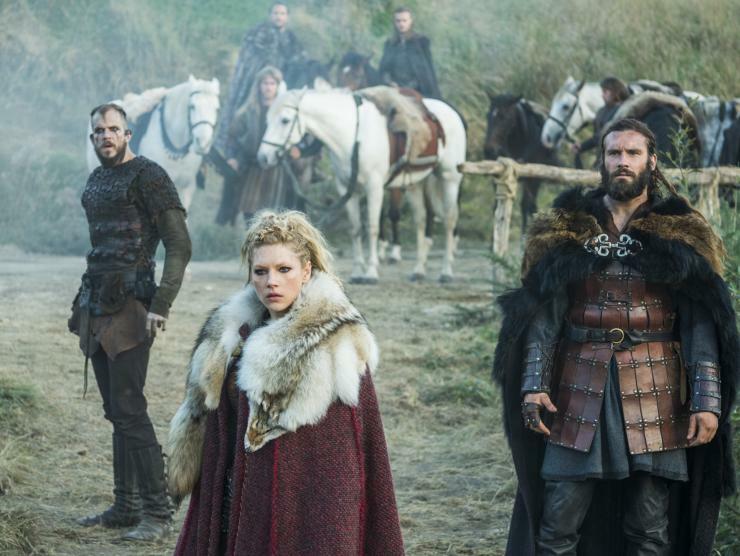 What did you think of Episode 9 of History Channel’s Vikings? Let me know your thoughts by commenting below! You can read my recap of the Season 3 finale here.